Decide on what devices are necessary to achieve your marketing goals. 3D Issue offers you the possibility to use the Flash version for PC and MAC users as well as the HTML5 version that enables users on iPhones, iPads, Android and other mobile devices to get the very best digital experience. 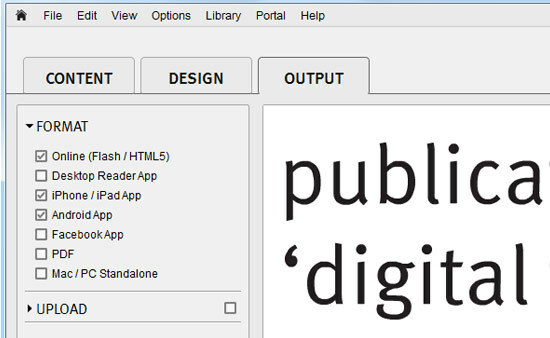 Design your PDF content with your designer or yourself. Make the most of your content. – Open 3D Issue Flipbooks software and import the PDF content. – Add an app icon: This will enable your end readers to have an App icon on their iPad or iPhone homescreen for quick access to the HTML5 web app of your edition. Read more on the app icon check here. To build the publication, ensure that the Output tab appears as follows checking the Online (Flash/HTML5), iPhone/iPadApp and Android App options. This ensures that the HTML5 is prepared and uploaded. Then you can upload your publication. – Copy and paste the URL from your computer and e-mail to your iPad to view the HTML5 version on iPad. If you prefer to view a video tutorial we have created a short video outlining the steps in this blog and showing you some examples of the software in use.